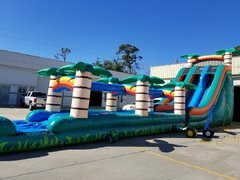 Water Slide Rentals | JumpyKing.com Bradenton FL. 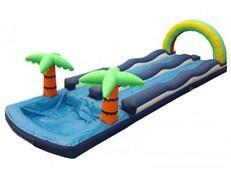 At JumpyKing.com we have the most exciting water slides perfect for making a giant splash at your event or celebration. These large colorful water slide rentals are the ideal centerpiece attractions that will definitely make a big impression on your guests. All of our water slide rentals are manufactured from "Lead-Free" vinyl and are cleaned and sanitized before every rental. Browse the selections below and click on the "More Info" link or the image to get additional information and to make a reservation.